So recently I stumbled upon something cool enough that I had to share it with you! While checking out the featured apps section on my iPad I ran across this music application called “Pacemaker”. The icon caught my eye with its simple design and bright-colored accents. Being curious, I proceeded to investigate. 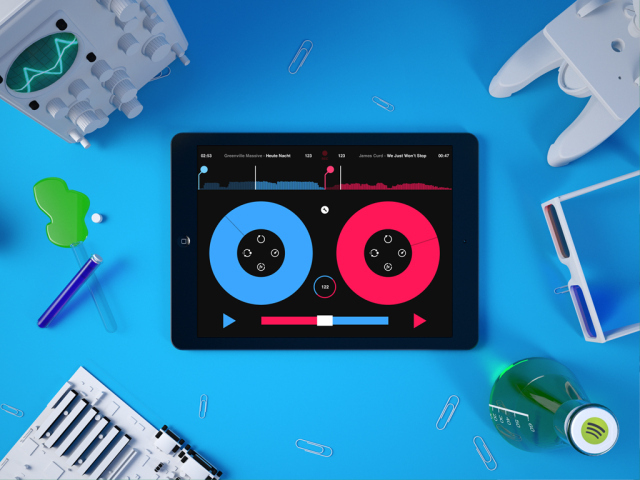 Pacemaker is a DJ application that lets you use your music from iTunes and Spotify to create your own live DJ party anywhere! But wait! That’s not why I’m writing and telling you about this. I’m excited to tell you about Pacemaker because It can slow down the tempo of any song without distorting the audio quality. Do you know what that means? This feature makes Pacemaker a godsend for us drummers! Got a song that you want to learn? A groove? Fills? Just pull up your song, touch the play icon, and tap the tempo button to open its settings and your on your way! Pacemaker displays a visual sound wave above so you can easily locate where you are in the song. I can remember in college we had CD turntables in our practice room for the drum set players. It was big and clunky. Nothing you wanted to try to carry around with you. Now you have the ability to slip that feature right into your book bag, or purse if you own an iPad. Check it out for yourself for free and see if it helps you during your practice time.